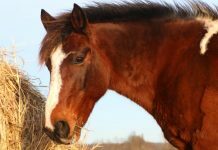 We once had a colt named Smokey here at the farm, and he was pastured with his dam out in “the back” pasture near a treeline. There was a nice path out along the fence leading to the far side of Smokey’s pasture, and it was always a nice place for a walk. We often took walks down that path with the excuse of saying hi to Smokey. A little ways from his fence was young wild apple tree that didn’t produce very well. The apples were always tiny and, if anyone tried them, usually pretty sour, but sometimes the tree produced some decent-size fruit. We would occasionally pick one or two of these apples, cut off a few pieces, and offer them to Smokey at the end of the walk. Smokey seemed to love the little tart apples, and always came running to get his piece, which he would take immediately from our hands and then happily crunch away on. His mother, however, was a little more particular. Whenever we held out a piece for her, she would cautiously sniff it before taking a bite. Sometimes she ate them, but if she apparently deemed the apple too sour, she would bob her head up and down a few times and then spit it out. This is a good example of how different horses can have varied reactions to treats. 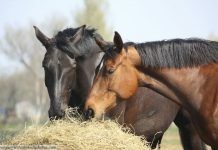 Many horses love treats; some can take them or leave them. Some horses will take a sugar cube, but can’t be bothered with fruits or vegetables and if you try to offer them one, they sniff it and turn their heads away. And of course, some horses will be happy to snack on a tiny tart apple! 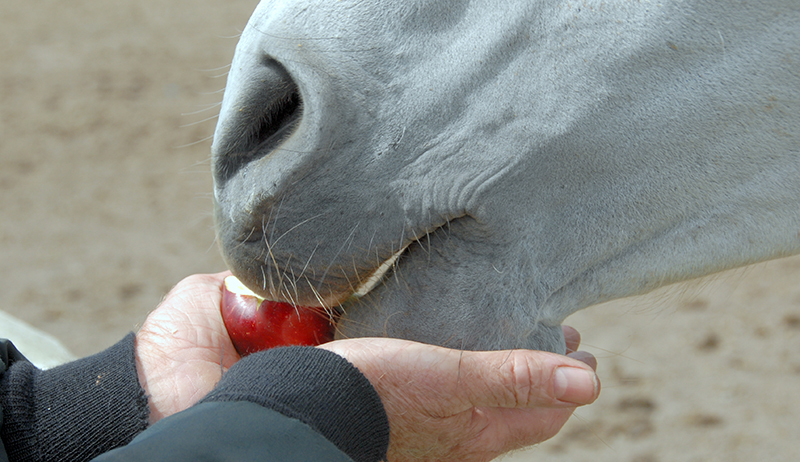 Sometimes horses are hesitant about a treat if it’s a new texture or smell that they aren’t used to. Even something as delightful as a sugar cube can be strange when a horse tries one for the first time. When introducing a new treat, expect to see some of that “I-don’t-know-what-this-is” head-bobbing, but give the horse a few moments to try it and he just might come back for another one. Whether it’s a fruit, vegetable, or even a store-bought horse treat—you may need to introduce them to your horse more than once in order to give him a chance discover the joy! Does your horse enjoy treats? What does he like? I was just looking at the list of NOT to feed, my horse has ulcers and I found a very good diet for soothing the stomach. It is grain free and one of the ingredients is dried cabbage, cabbage is very high in the amino acid L-glutimine and that is also added to Omeperozole. I actually purchased a dehydrator and make my own dried cabbage, he gets about a tbsp/per day. I see no ill effects. 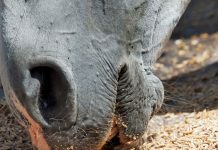 Donna Lee, is it because cabbage causes “gas” the reason why “not” to feed to horses. I know rabbits, specially the young will blot(sp??) and die. Dried at least will not cause gas to built up. That is good to know. My friend has a horse named Gracie and she really likes goldfish. But the weird thing is she doesn’t even look at her salt lick, but when other horses may be put in that stall they always seem to enjoy it. Watermelon!!!! We have even rode into an wild watermelon patch and Dreamer stomped on a Big one then started eating it. Watermelon is great for trail rides when there is little or no water on the ride. my old mule LOVED almonds. he’d eat the shell & all but I worried about sharp edges so bought him the shelled ones. walnuts were enjoyed, too…but almonds were his favorite over everything else, evem Mrs. Pastures horse cookies. I used to have a mare who loved granola bars. Cinnamon granola bars were her favorite. She always knew when I had a different flavor. Of my current horses, my gelding loves apples, carrots, pretty much everything sweet and my mare loves carrots but will spit out apples. Doesn’t matter what type of apple. She’s just not into them. My horses love dried apricots and mangos from costco!